If you are looking for ways to improve work performance, you have come to the right place. 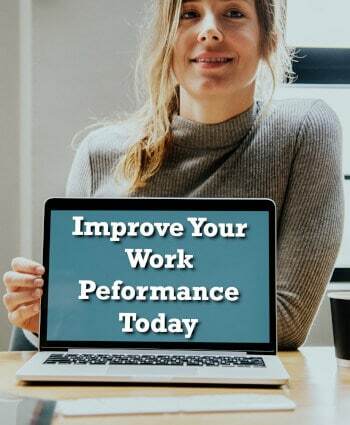 In this article, we will cover the 33 best ways to improve your work performance so that you can move forward faster, better. The most important step to increasing work performance is to make sure you are doing what is important! Many people spend months and years at their job with an unclear view of what they were hired to do and what their most important tasks are. They end up spending a lot of their time on tasks and activities that waste time and really aren’t important. Know what you were hired to do and what your most important tasks are. If you don’t know, talk to your boss or supervisor about it. Brian Tracy in his book Eat That Frog! (and in some of his other books) says that everyone has three core tasks that make up 90% of our contribution. Bottom line: Know what you were hired to do. Know your three most important tasks. Then, focus on those tasks when you work. 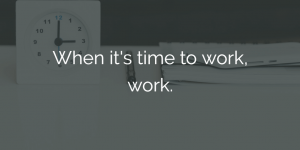 For more productivity tips, check out The 40 Top Tips to Improve Your Time Management At Work. It’s also important to know what your goals and priorities are for work and personally. Are there certain goals or priorities that your company or department are pursuing? In your area, focus on the tasks that help meet those goals. And personally (whether related to work or not), are you doing the tasks that help push you toward your goals? Do you even have them written out? Bottom line: Know your goals and priorities. Focus on the activities that push you toward them. Drop the ones that have no value. For more on goal setting, check out Your Guide to Setting Business Goals That Work (And Common Problems to Avoid). Pareto’s principle, also known as the 80/20 rule, states that 20 percent of our effort produces 80 percent of our results. 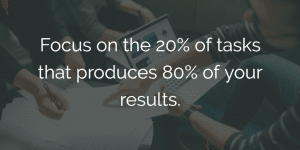 In other words, of the work that you do, 20 percent of it makes up for 80% of the results you produce and of the contribution you make to your company. It means you need to find ways to focus more of your energy on the 20%. Too often we focus on the 80% that only produces 20% of our results. We need to reverse that. 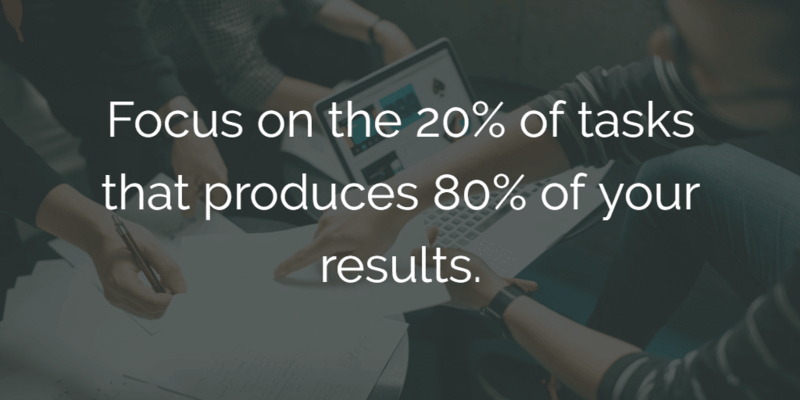 Bottom line: Focus on the 20% of tasks that produces 80% of your results and contribution to your company. To help you be able to focus on your most important tasks, you need to delegate, delay, diminish, or eliminate tasks. Is there someone that you can delegate tasks to for tasks that aren’t important for you? Remember, what might be “unimportant” to you may be “important” to them. Find ways to delegate tasks that must be done but aren’t part of your 20% or what you were hired to do. Depending on your position, you may even want to outsource some tasks so that you can focus on what’s most important for you. On another note, Brian Tracy says that we should never do tasks that are below our pay grade. In other words, if you get paid $25 per hour, you shouldn’t do tasks that a $10 per hour person does. You should pass those tasks to a $10 per hour person and focus only on tasks that are worth $25 or above. Some tasks may need to be done by you, but not right now. You may delay some of your tasks in order to focus on what’s most important for the moment. There may be some tasks that you may have to do but aren’t that important. 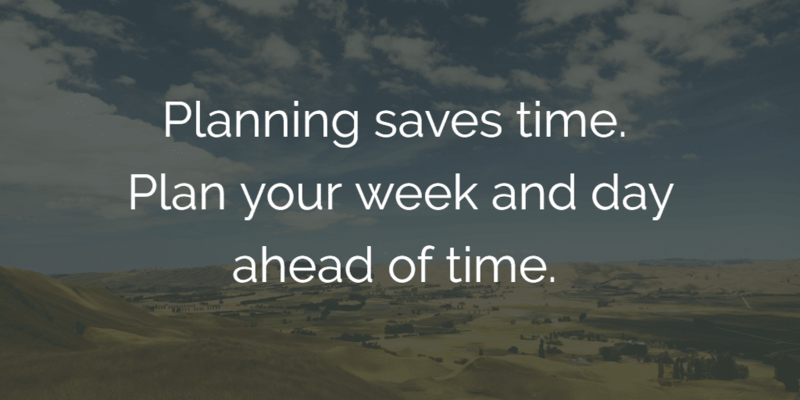 See if you can diminish those tasks by reducing the amount of time it takes to do them. Is there a template you can use? Is there a similar document you can copy? Is there someone skilled in a certain area that can help you? Does it have to be perfect? Can it be “good enough”? Truth is, some tasks that we do can just be eliminated. They have no value. They may seem important because it comes in an email and/or is “urgent”, but in reality, it’s just not important. See what tasks on your list that you can eliminate with no consequences one way or another. Does everything on your list have to be done? Bottom line: For tasks that aren’t in your 20% and that you weren’t hired to do, find ways to delegate, delay, diminish, or eliminate those tasks. According to Brian Tracy in Eat That Frog!, every minute we spend in planning saves us 10 minutes in execution. It keeps us from wasting time on unimportant tasks or figuring out what to do when we get to work or what to do next. Better yet, not only plan your day, but plan your week. You may not know what you will do exactly every day, but you may plan what general focus you need for the week. This is important because if we plan only day by day, it can be easy to lose sight of the big picture of what we are trying to accomplish. 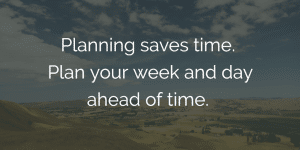 Bottom line: Planning saves time. Plan your week and day ahead of time. When we get to work, it can be easy to piddle around and focus on the easier tasks first. Focus on the most important tasks first. When you do the hardest, most important tasks first, it makes the rest of your day easier. And it also makes sure you accomplish something important for that day. When we wait, we can dread getting to the task throughout the day, and, with how crazy our days can be sometimes, we may never get to them. Then we have spent our whole day without doing what is most important. Do the most important tasks first so that, even if your day does go crazy, you still accomplished what was most important. Bottom Line: Do your most important tasks first when you start your day. Multitasking is a killer of productivity. When we are trying to do more than one task at a time, we are less efficient and less productivity. Focus on one task at a time. Give all of your attention to the one task, ignore distractions, and get it done. And, if possible, focus on the one task till it’s done. When you switch between tasks, there is a switching cost. You have to take time to reset yourself for the task when you get back into it. You have to figure out where you were and get all of the materials you need for it again. Here are some other articles on the ineffectiveness of multitasking. Bottom Line: Don’t multitask. Focus on one task until it’s complete. When you start a task, make sure your desk is clear of everything that is not related to the task. Then, make sure you have everything you need to complete that task ready and on your desk. This saves you time by not having to search or sort through items to find something. Bottom Line: Have everything you need for a task, and only what you need, in front of you on your desk. As much as possible, schedule for yourself blocks of uninterrupted time. 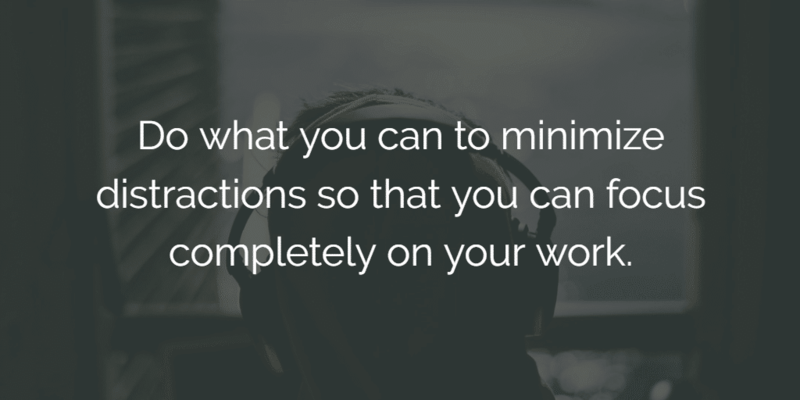 This will allow you to focus on your tasks without distraction and get them done. The amount of time you set depends on you and your job. You may do periods of one hour or three or four even (or 30 minutes if you have to). However you do it, make sure that everyone knows that you are not to be disturbed during this time and remove as many distractions as possible. Bottom line: Set blocks of uninterrupted time with minimum distractions to accomplish your most important tasks. As you go through your day, it can be easy to get distracted by the craziness and “urgent” requests that may come your way. 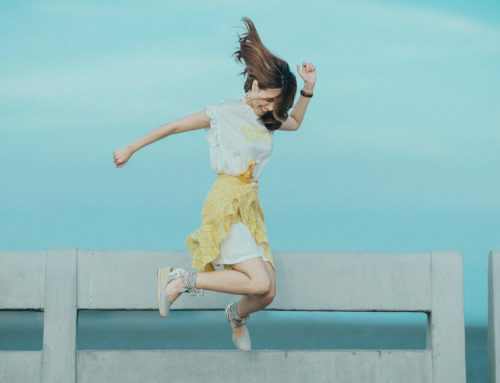 If you find yourself caught in the whirlwind of your day, ask “Is what I am doing moving me toward my goals?” or “Is this part of my 20%?” If it’s not, drop it (if possible) and move to something that better. Bottom line: Make sure that you are focusing on what is most important by asking yourself the right questions. Many people waste the beginning of their day by having idle chats with coworkers, checking Facebook or catching up on the latest sports or news. When you get to work, start off working. Don’t even check your email (if possible). 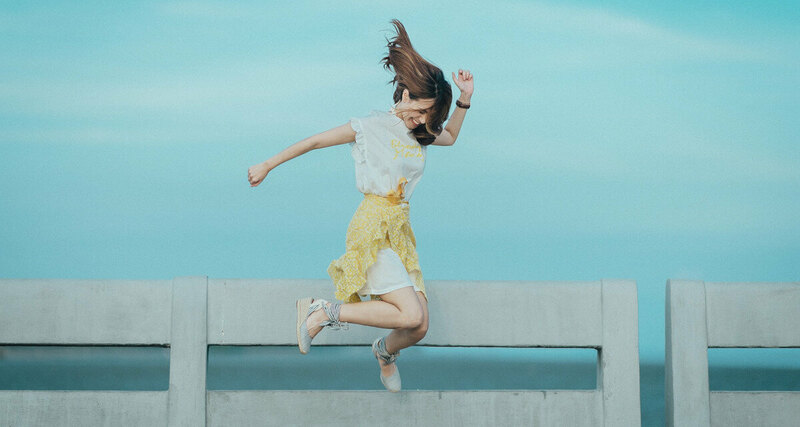 Jump straight to your most important task and get it done. This will set you apart from many of your coworkers and improve your work performance. 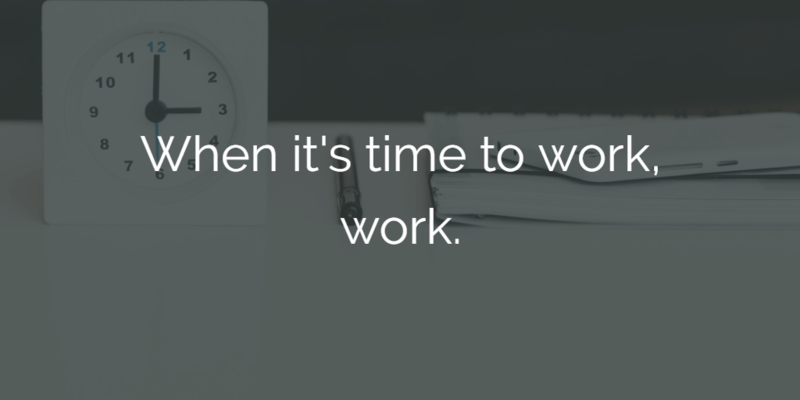 Bottom Line: Don’t waste time when you get to work. Start working immediately and get your most important task done. This is one is may seem obvious, but it’s not a principle that is frequently followed. Many waste time piddling, checking the news, social media, or chatting with coworkers. Don’t be like that. If you want to set yourself apart and improve your work performance, work while you are at work. Save socials, chats with co-workers, and internet browsing for during your breaks or when you are at home. Bottom line: When it’s time to work, work. If you really want to increase your performance and get more done, get to work early. Often, when you are early, you are free from distractions and can get a lot more done than when everyone else arrives. It says something when you have finished a big part of your most important task (or all of it) before anyone else even gets to work. It also shows to your boss or supervisor that you are committed. Bottom line: Arrive to work early and get your most important task started (and done) before distractions start. While it’s important to work while we work, it’s also important to take breaks along the way. The Draugiem Group installed time tracking software on their computers and found that their top 10% of producers didn’t work more but took more breaks. On average they worked 52 minutes then took a 17-minute break. When you work straight through and don’t let your mind rest, you become less productive, not more productive. Especially if you are stuck, taking a break can help give you insight on what you are working on. Work while you work, but make sure to take breaks for better productivity. One common technique is the Pomodoro Technique. Bottom line: Make sure to take breaks throughout the day. It will make you more productive than if you work straight through without stopping. One way to save more time and get more done is to group similar tasks together and batch them. If, for example, you have to sign reports, don’t do some now then some later. Do it all at one time. Answer emails at one time and return phone calls at one time. This saves switch costs and helps you get these tasks done faster. Bottom line: Group similar tasks together and get them done at one time. Parkinson’s law says that “work expands to fill the time available for its completion”. 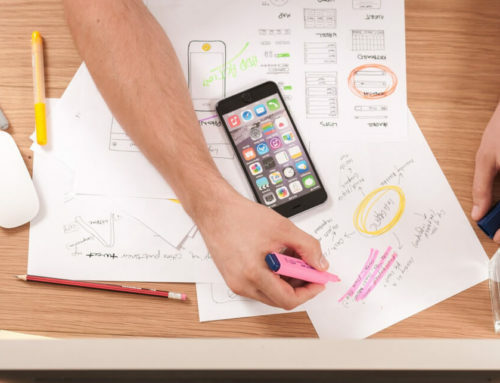 While you don’t want to set unrealistic deadlines, by setting deadlines for your tasks, you can often complete your tasks faster than you would have otherwise. Bottom line: Set realistic deadlines for your tasks. If you want to improve your workplace performance, you need to learn to manage and minimize distractions. Notifications can be a bane of productivity. Often when an email pops up, we are tempted to check to see what the email says right then, breaking us from the task we are working on. Even if we resist, there’s often the curiosity of “what is it” that drives into our minds and distracts us from the task at hand. Instead, turn off all notifications on your phone and email and only check them at a set time that you schedule. If you can, turn off your phone and only have set times you answer or return calls. Even if you don’t listen to music, wearing headphones can reduce some of the noise from the workplace and discourage people from interrupting you. On that note, music can help boost productivity. If possible, have set times when you are not to be interrupted. You can also have a sign letting people know that you are not to be disturbed. It won’t stop everyone, but it can help. Let people who stop by know that you are busy but you can check with them later, or ask them to email you their issue. Here are some other tips on dealing with people interruptions. 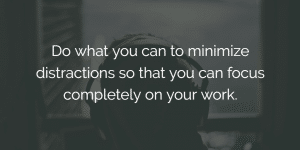 Bottom line: Do what you can to minimize distractions so that you can focus completely on your work. One frequent waste of time is people constantly stopping by asking if you’ve “got a minute” for a question or to deal with a problem. Often these minutes turn into much more. Instead, have set times when people can stop by to ask questions or come to you with a problem. When they come, make sure they aren’t asking you to fix it for them but have possible solutions ready. You can also set a time limit for each interaction. Or, unless it’s an emergency (it usually isn’t), tell them to put it on the agenda for the next meeting. And, if you are okay with people stopping by anytime, make sure they understand the importance of your (and their) time. Make them come with solutions and make sure conversations stay on track. Bottom line: Control “got a minute” meetings, or they may end up taking up a lot of your time. When possible, have set times when you will check your email and answer your phone. You may a time in the morning and in the afternoon, or 3-4 times during the day if that is what you need. This saves you from wasting time checking it and getting distracted by tasks that aren’t as important as what you should be working on. 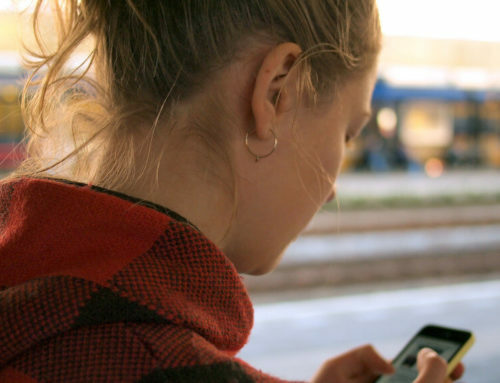 Bottom line: Scheduling time for checking email and returning and making phone calls can help you focus on your more important tasks and helps keep them from being distractions. When the content changes subject, change the subject line. This keeps you and the other person from having to remember what the subject line was for what you talked about when searching for it. Also, use acronyms in the subject line to help people know what the email is about or to even save them from having to open it up. Make sure to keep your emails short and sweet. 3-5 sentence is perfect. No one wants to read an essay in an email (and usually, they won’t). Bottom line: Write short emails and make sure your subject lines let people know what the email is about or what to do. We can easily waste time checking the same email or looking at the same report of pieces of mail multiple times without ever taking action on it. Instead, follow the “touch it once” rule. 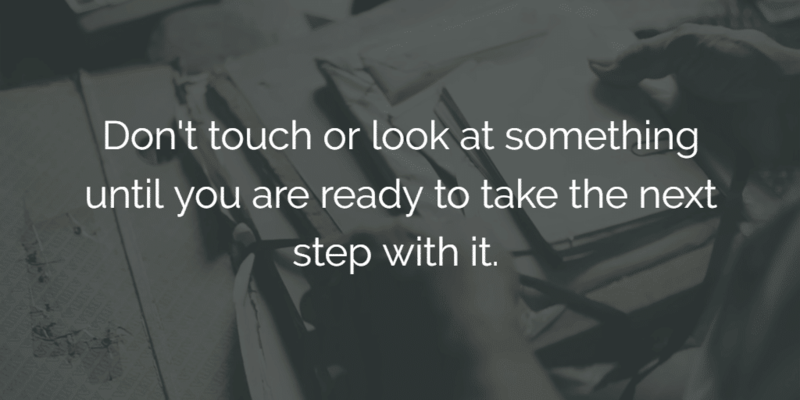 Don’t touch anything unless you are willing to take the next step for that task, whatever it may be. Next steps may be contacting someone, answering it, scheduling a task, filling something out, etc. Don’t look at an email unless you are ready to answer it. Don’t touch your mail unless you are ready to go through it and decide on it. 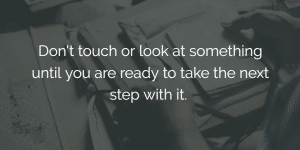 Bottom line: Don’t touch or look at something until you are ready to take the next step with it. You may have heard the saying “you are the average of the 5 people you spend the most time with”. It applies to work as well. If you hang around with unproductive people, you are going to be unproductive. If you hang around with productive people, you are going to be more productive. Spend time with the productive people at your work, the ones who stand out, the 20%. If they are seen as quality people who get results, be around those people. Bottom line: Spend time with productive people, not unproductive people. 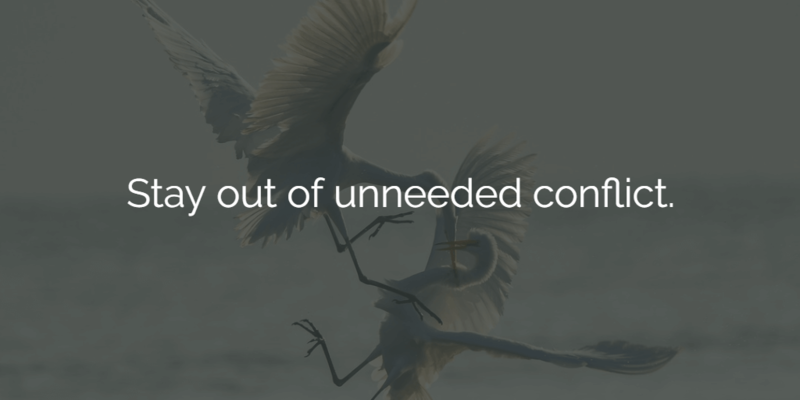 One reason we too-often are overwhelmed, over-stressed, and working on tasks that really aren’t important to us is that we have a hard time saying “no”. If you want to improve your work performance, learn to say “no” to tasks that aren’t part of your 20% or your core three. Remember, saying “yes” to one thing is saying “no” to another. By saying yes to unimportant tasks, you are saying “no” to the more important ones. What about with your boss? If your boss asks you to do something, and your plate is already full, let your boss know what you are working on. Tell him or her that you have time to do this task that task or that task. Then ask which one would he or she would prefer you to work on and which one does he or she want you to drop? Bottom line: Say “no” to any task that isn’t part of your core three or 20%. Saying “yes” to an unimportant task is saying “no” to the important ones. Let’s be frank. Some bosses are bad about giving good feedback. Some wait for the annual review to let you know you haven’t been doing what they expected for last 6 months. Take it upon yourself to get feedback. Make sure that what you are doing is aligned with the goals that your supervisor and company have for you and the company. This will help you stay on track and make sure what you do is the most productive. It also shows initiative. Bottom line: Make sure to get feedback about your work, whether your boss initiates it or not. 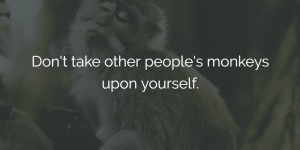 You waste your time and make others unproductive when you constantly take on other people’s monkeys and their problems. 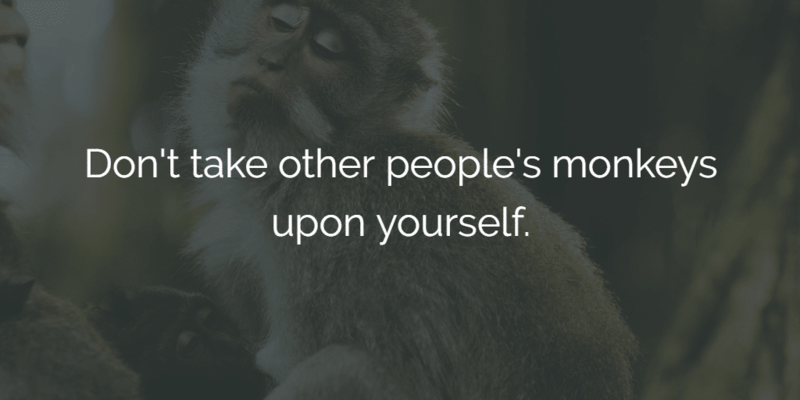 Instead, help those around you handle their own monkeys. If they come to you, make sure they come to you with a solution in mind. It’s okay to help guide them, but don’t take it upon yourself to solve it. Bottom line: Don’t take other people’s problems upon yourself. Help direct them if needed, but don’t take it upon yourself to fix it for them. Jim Collins, author of Good to Great recommends creating a stop doing list. What are you doing that wastes your time? What are you doing that doesn’t move you toward your goals and priorities? 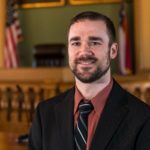 What are you doing that may be “good” but not the “best”? Write those on your stop doing list. Then, work on stop doing them. 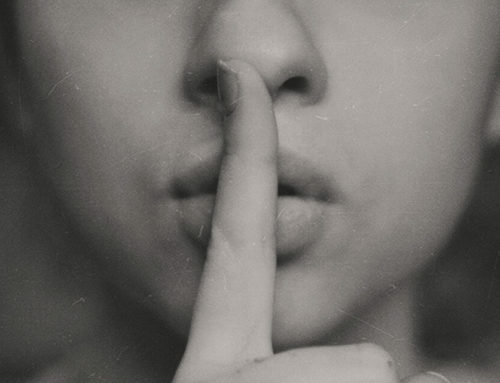 Bottom line: Make a list of things you need to stop doing – and stop doing them. 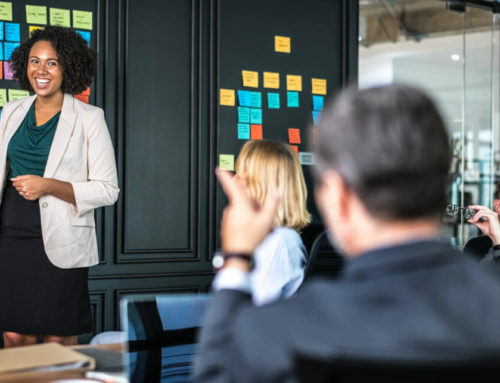 If you want to really improve your workplace performance, then one of the most important steps you can take is to always be learning, growing, and improving yourself. You are either appreciating or depreciating. You are either learning and getting better or forgetting and getting worse. One of the best places to improve yourself are the tasks that are most important to your job. If you use the computer frequently, but don’t know how to type, that would be a good skill to learn. If you are in marketing, reading marketing books and keeping up with marketing trends will help push you forward. If you have one area that it’s in your job description that you are weak in it, improving that area will bump up your complete performance. If you want to get into leadership and management or keep advancing, learning more about leadership and management would be a wise choice. Whatever you choose, keep learning. Bottom line: If you want to get ahead, always be learning, growing, and improving yourself. In a manufacturing scenario, a bottleneck is a machine that slows everything else down. It doesn’t matter how fast the other machines produce; if that one machine goes slower, and the other machines rely on it, they will have to wait for it. It’s the same in our lives and work. We may be weak in one area, and it slows us down. By fixing that one area, we will boost our productivity many-fold. Again, if you can’t type but you have to write reports, that is a bottleneck. If you need to use spreadsheets but don’t know how to use it or use it well, that is a bottleneck. If your not very knowledgeable in one of the areas that you are responsible for, that can slow you down. Improve those areas, and you will boost your productivity and performance at work. Then, move on to the next bottleneck. Bottom line: Find what your bottleneck is and fix it. Some tasks can be hard to start. They seem so formidable and large that you delay getting to it. We end up wasting time and lose productivity. Plan out projects and goals step by step. 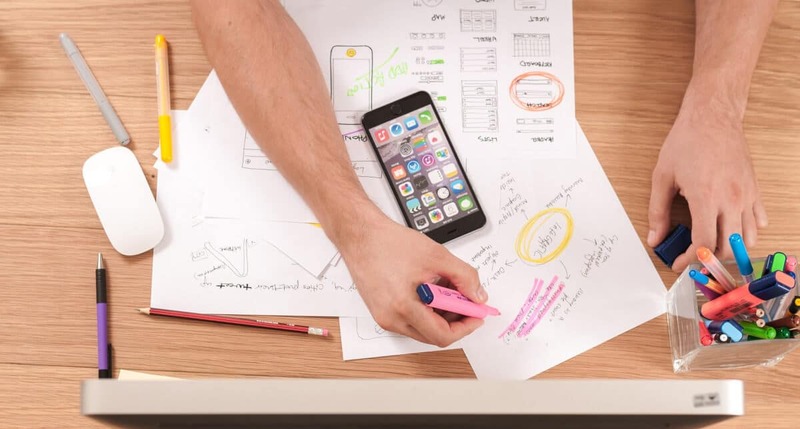 Whether you use paper or a mindmap or project management software, plan out the project or goal step by step. Then do one step at a time. Once you have it planned out step by step, just focus on doing the first step. Then the next. Then the next. Focus on the small pieces, not the whole piece. If it still seems formidable, just focus on doing one task and that’s it. Just tell yourself you are going to do one part and quit. Once you get going, you often can keep going. Just work on it for a few minutes. You can also set a timer for 5 or 10 minutes and plan to work on it for that long only. Then, once you get started, you may have the motivation to keep going. (See Brian Tracy’s Master Your Time Master Your Life for more tips). Bottom line: Don’t let large tasks scare you. Break it down into small pieces; then take it on, one small step at a time. 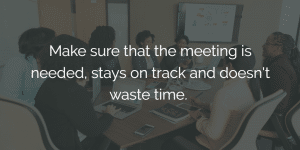 Meetings can be extremely useful – and they can also be the bane of workplace productivity. First, if the meeting doesn’t need to happen, don’t make it happen. If it can be handled over an email or phone call, do it. Second, don’t attend meetings that you don’t need to be part of. Third, make sure each meeting has an agenda, and it’s followed. Also, don’t allow any new items to the agenda during the meeting. Have a set time by when people can submit an item to the agenda. Fourth, have a start and stop time for each meeting. Make sure you start on time, even if everyone is not there, and make sure to stop at the stop time. The stop time can be a motivation to help people stay on track. Fifth, don’t allow people to get off track. When people start getting off track in the conversation, bring it back in and focus. Sixth, consider a standing meeting. Standing meetings are generally shorter and to the point. Seventh, consider a daily huddle. 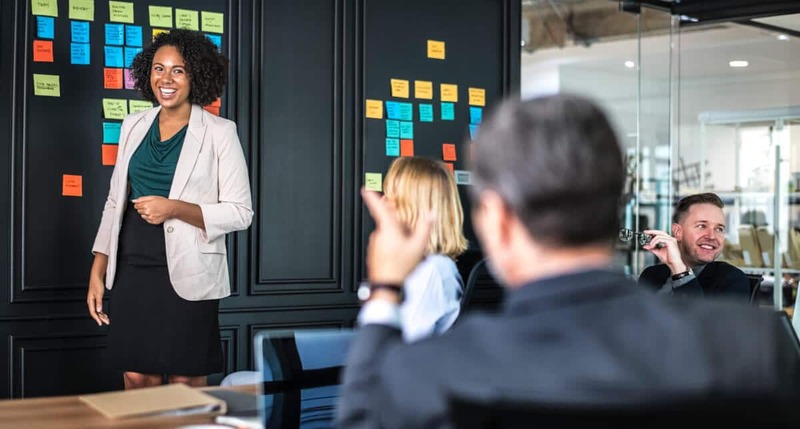 Having a short daily huddle can save time from having to conduct various meetings during the day and keep everyone on the same page. Here are some ideas on holding a daily huddle. 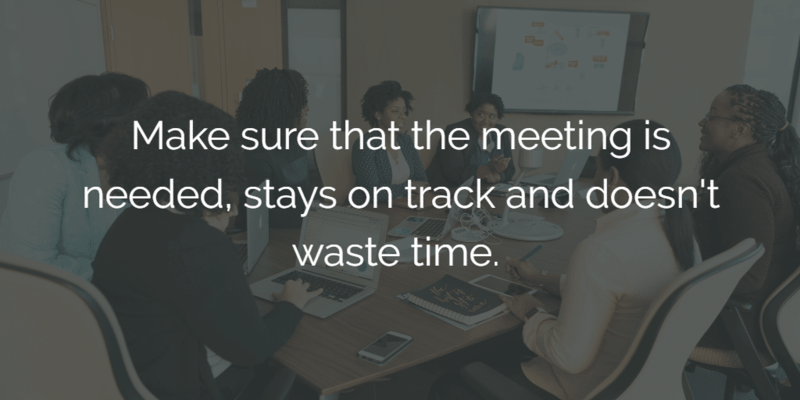 Bottom line: Make sure that the meeting is needed, stays on track and doesn’t waste time. It makes sense: if you have more energy, you will be more productive and your performance at work will increase. To do that, make sure you are getting enough rest. If you are always tired, relying on coffee, and dragging around, your performance will suffer. Eating well and exercising also contribute to greater energy. Bottom line: If you want greater productivity at work, have more energy by getting enough sleep, exercising, and eating well. Our energy ebbs and flows. There may be times when we are at our peak and super creative. Other times we struggle to come up with ideas. Know your highs and lows. If you are most creative in the morning, for example, try to do your most creative work then. Also, figure out what helps boost your energy. If taking a walk or focusing on your goals or doing a different task helps rejuvenate you, do that. And, if you know certain tasks drain you, wait toward the end of the day to do those, not the beginning. Bottom line: Adjust your schedule to accommodate your energy highs and lows. Know what helps energize you and save the draining tasks for last. One cause of turmoil, tension, and low productivity in the workplace is conflict handled poorly. 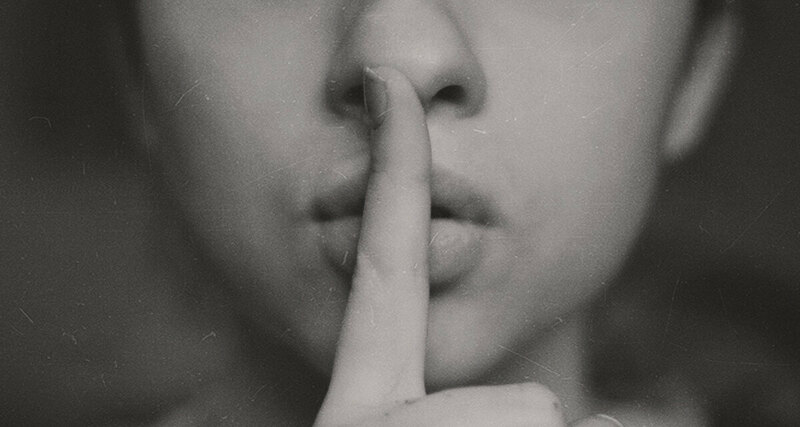 When people gossip and complain to each other, build allies, or triangulate (getting someone else involved to solve it for them), there are major issues. Don’t waste your time with that. People need to go to the person they have a problem with, not to other people. Don’t let people come to you to solve their problems with other people. Let them deal with it. If they need mediation, that can be a possible option, but don’t get involved and solve their people problems for them – they need to learn to do that themselves. (And any mediation or policies of that nature should be part of company policy). Also, don’t get caught up in any of the gossip. Don’t waste your time with it. If you have an issue with someone, go straight to that person. If you happen to hear a rumor, talk to the person and get the facts. Don’t waste your time with workplace idiocy. Bottom line: Don’t get involved with workplace gossip or let others involve you with their issues with someone else. If you have a problem with someone, go to that person, not to other people. Of all the 33 ways to increase workplace productivity, the most important is to make sure you know and are doing what is actually important. Otherwise, you will be super productive in accomplishing nothing. After you know what is most important, make sure you start working on the most important tasks first (and that usually comes through planning!). The rest of the ways are icing on the cake that will boost you even further, faster. What stood out to you the most? Do you have any suggestions that we missed? Let us know in the comments below.